You’ll never look at tubs the same way again after viewing this list of incredible, soak-worthy hotel bathtubs around the world! There’s nothing quite like long, pampering soaks in a fancy bathtub to rejuvenate the soul. While many of us are contented with having a basic white tub in the hotel bathroom, some places really do take bathtub designs to the next level, creating a luxurious themed bath experience and setting a new travel trend among the bathtub lovers. 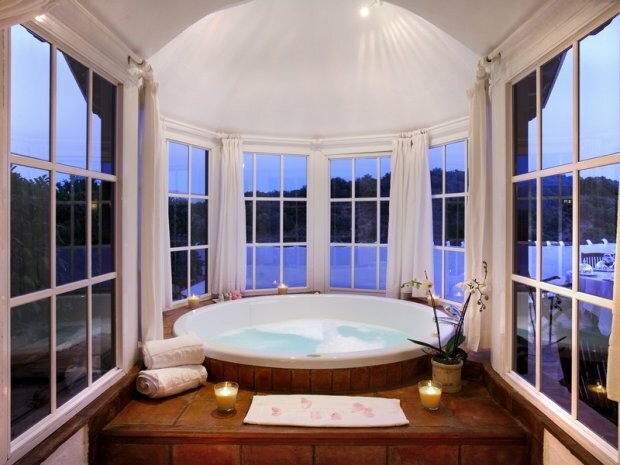 Here are some of the most incredible hotel bathtubs in the world. 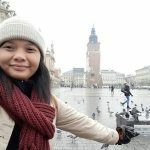 There seem to be something for all - from the outdoor lover and exhibitionist to the hopeless romantic and conservative. 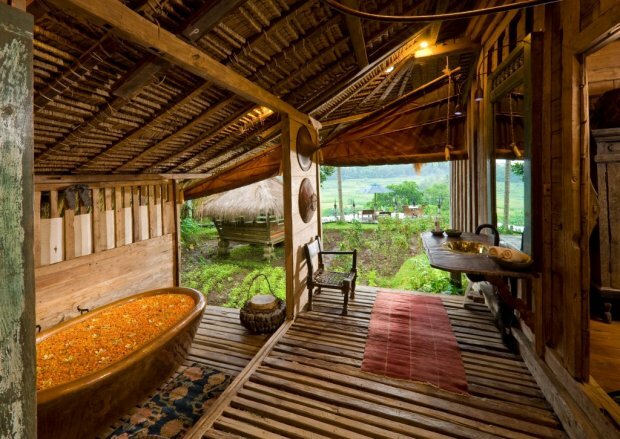 These open-air bathtubs are surrounded by lush forests, serene nature and breathtaking views. 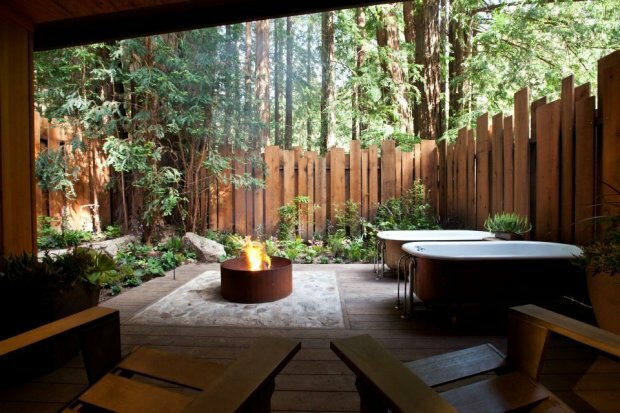 Built amidst the wonderful setting of Big Sur, California, Post Ranch Inn features this adjacent terrace that gives its guest the chance to soak in the bathtub while taking in the beautiful scenery. If you love the tropics, you’ll enjoy staying at the GoldenEye Hotel & Resort in Jamaica. This hotel features large foldout doors leading to an outdoor tropical garden where this tempting claw-foot outdoor bathtub awaits. 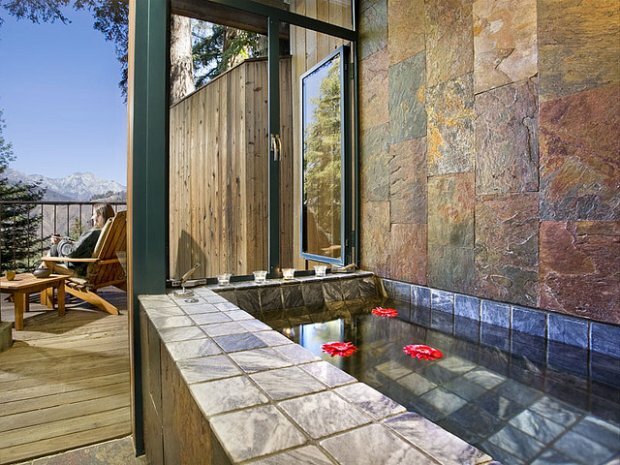 This outdoor terrace of Glen Oaks Big Sur is fully equipped with two outdoor claw-foot tubs that are ready to rejuvenate your senses amidst a rustic setting. Bambu Indah in Bali, Indonesia features an exquisite copper tub designed and hand-made by John Hardy, a notable jeweller and the founder of this eco-friendly boutique hotel. 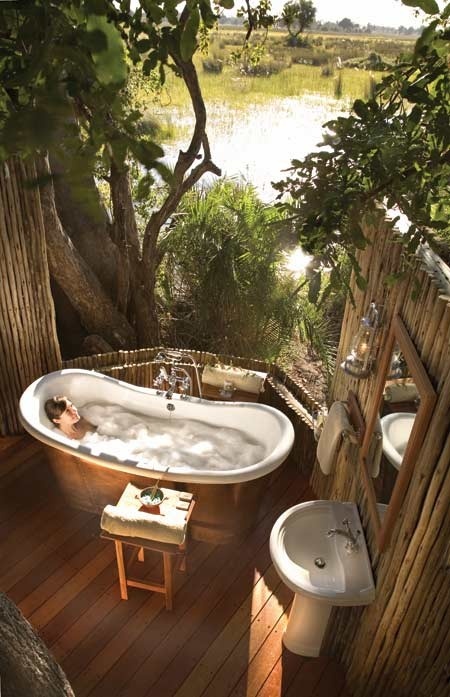 Hailed as one of the world’s coolest bathtubs, this Afrika bathtub provides an indulgent experience. 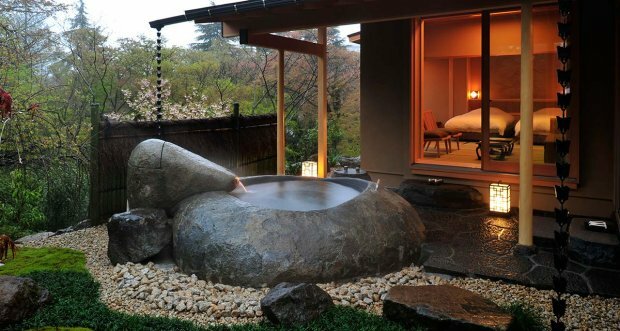 Gora Kadan in Kanagawa, Japan makes sure its guests are well-pampered with its open-air big stone bath that is built in a Japanese garden a few steps away from your cosy room. 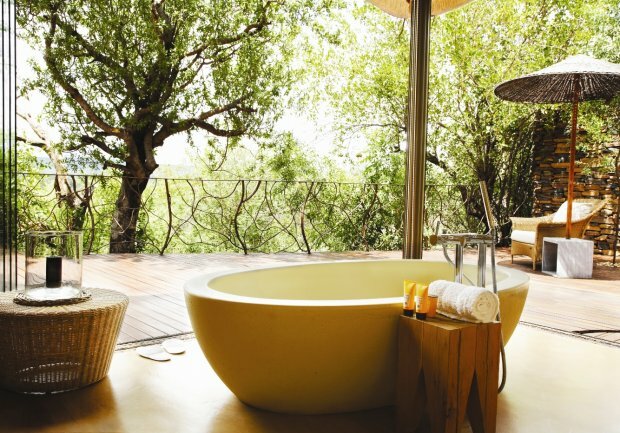 If you are physically exhausted after a safari trip, Molori Safari Lodge in South Africa provides the best relief with its private Sephiri bathtub and an intimate terrace overlooking the nature reserve. Can’t get enough of your safari trip? Why not relax and soak in Belmond Safaris’ outdoor bathtub while still feeling the adventure in the Okavango Delta, Africa’s best preserved delta that has just been listed as a UNESCO World Heritage Site. These outdoor bathtubs are perfect for those who are confident enough to risk someone seeing their exposed body. Located in the lovely island of Olhuveli, in the Laamu Atoll, Maldives, this eco-friendly resort is an unforgettable retreat in a luxurious tropical setting. 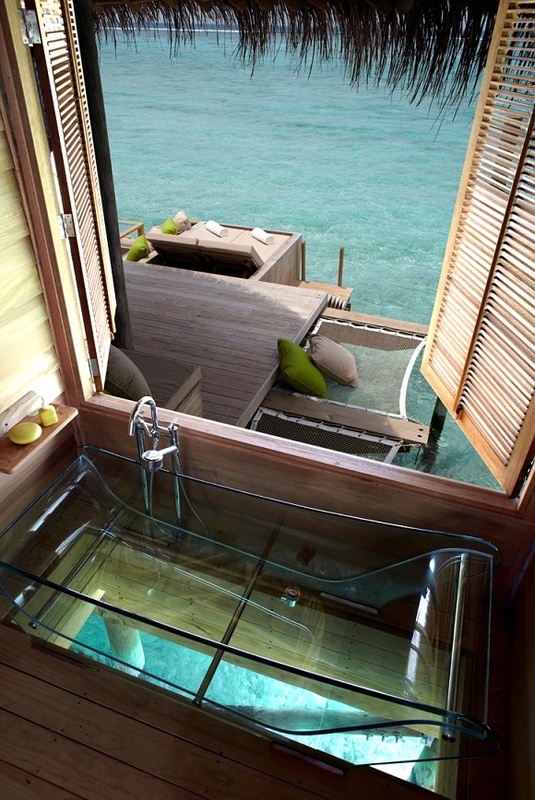 This above-water villa features a glass bathtub that won’t let you lose sight of the surrounding turquoise waters, adding a more relaxing effect to the already pleasant atmosphere. 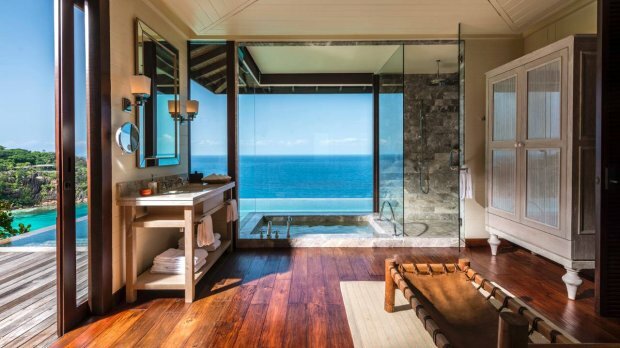 Set in a lush island sanctuary, Four Seasons Seychelles offers an unmatched bathroom experience with a glass walled bathtub that lets you see the tranquil azure waters of the Indian Ocean. Beautifully located in the southern tip of Legian Beach, The Stones Hotel - Legian Bali Autograph Collection gives you the finest comfort with this lavish balcony bathtub that is overlooking the pool area. Barceló La Bobadilla offers a different kind of bathroom experience right at the heart of Andalusia. 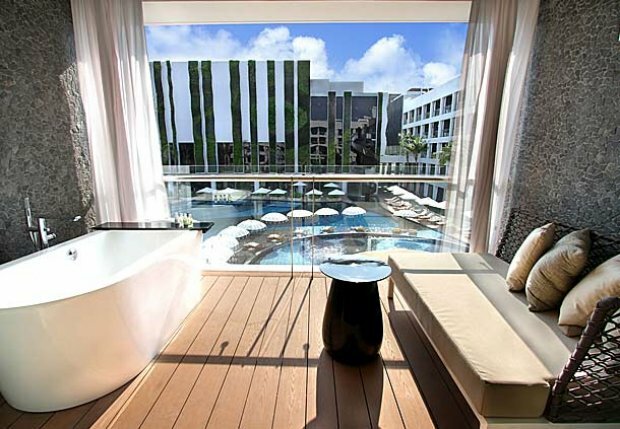 Guests may relax in a Spanish-style bathtub while seeing the outside beauty through the huge glass windows. 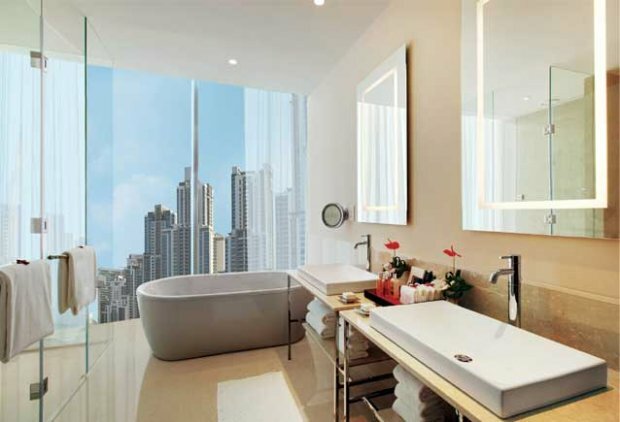 Nothing is more pleasing than Oberoi Dubai’s free standing bathtub on a spacious marble bathroom with floor-to-ceiling windows that allow you to gaze at the city’s stunning skyline. 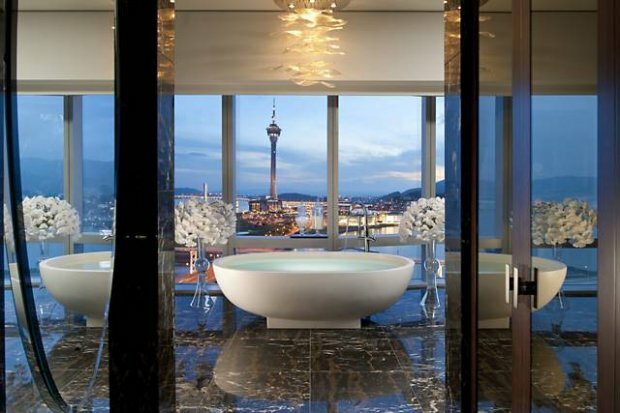 Dipping in Mandarin Oriental Macau’s presidential suite bathtub will make you feel like the most important person in the world. Not to mention the modern glass windows that let you enjoy the overwhelming Macau cityscape. 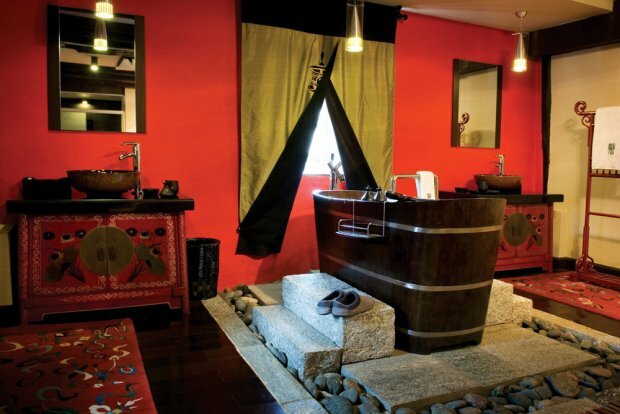 For the middle-of-the-road individuals, here are luxurious private bathtubs to let you soak in tranquillity with a peace of mind. 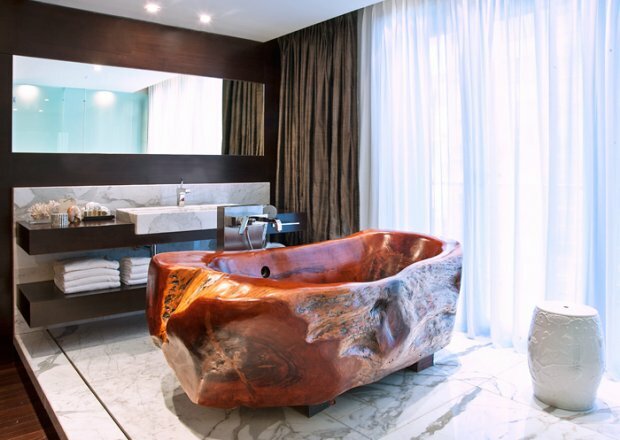 Hand-carved by the Argentine artist Mario Dasso, this piece of native calden wood bathtub in Mio Buenos Aires rests in a spacious bathroom to give you a naturally refreshing experience. A ritual must be done in order to enjoy the therapeutic effect of this bathtub. 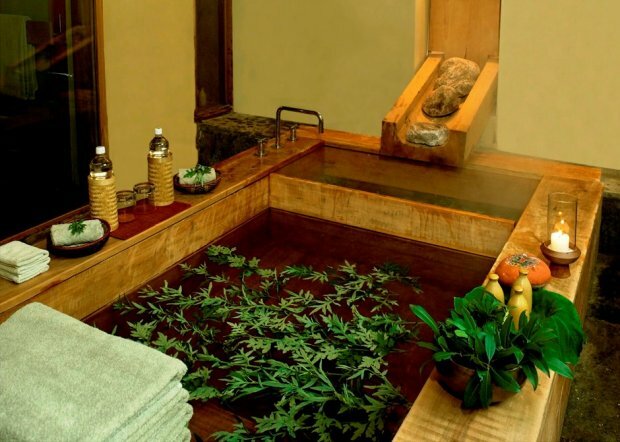 When the hot water begins to cool, the guest should strike a Buddhist singing bowl to signal the attendant to put the heated stones in the small portion of the bathtub. Instead of soap and bubbles, the water is filled with khempa, a local herb in Bhutan that is believed to treat skin conditions. Located in a scenic area in Yunnan province, Banyan Tree Ringha’s decor reflects the local Tibetan culture - from the intricate woodcarvings and smoky fireplaces to wonderful balconies and wooden bathtubs. 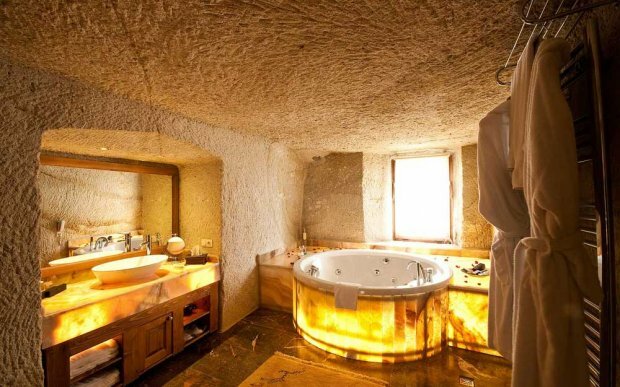 Set in the majestic region of Cappadocia, Museum Hotel’s Gulistan cave suite bathtub is designed and lavishly decorated to give you security and comfort inside a peaceful cave-like setting. If you want to keep it simple, this tub is right for you. 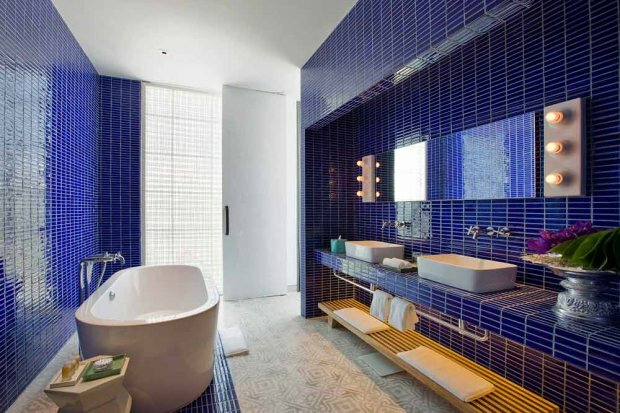 The white bathtub at Point Yamu by COMO in Thailand complements its blue wall accent, giving you a simple yet sophisticated bathroom experience. 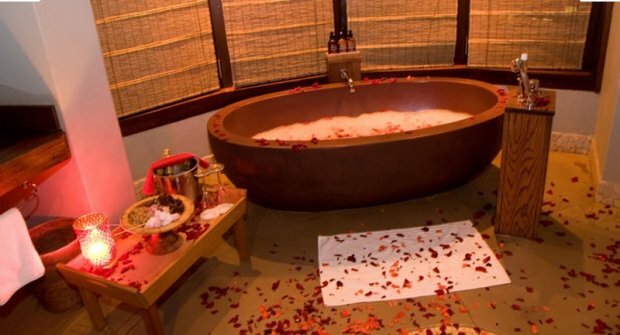 Great not only for the hopeless romantics, these bathtubs also win the hearts of honeymooners. 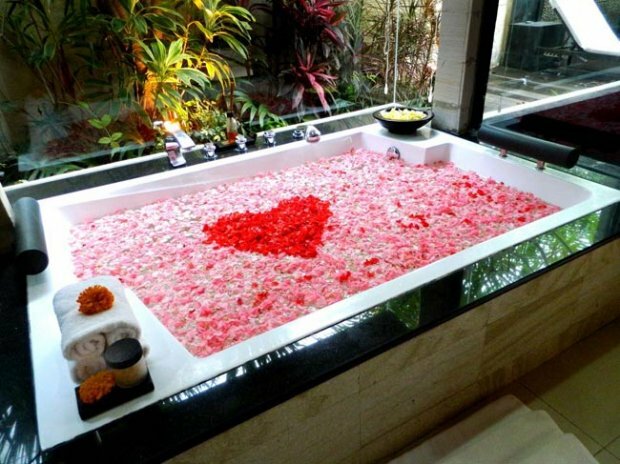 Rose petals sprinkled in a bath is a romantic touch that can ignite the passion of lovers. 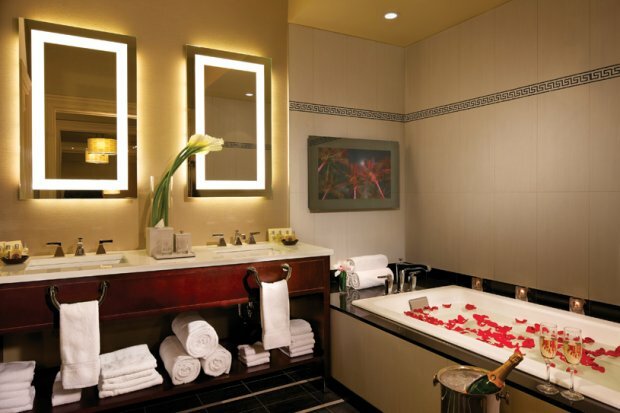 Exclusively for couples, Pocono Palace features a Grand Roman theme bathroom with floor to ceiling columns, great arches, vaulted ceilings and the highlight of them all - the champagne tower bathtub. No, you’re not dreaming! 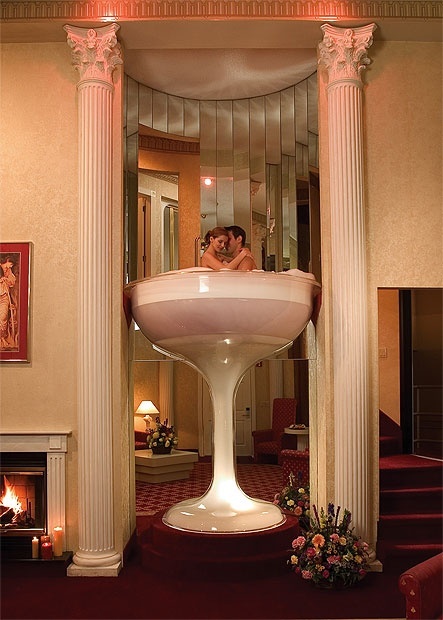 It’s a real towering champagne glass that guarantees an unforgettably romantic bathroom experience. South Africa’s Thanda Private Game Reserve lets you stay in a honeymoon tent complete with a shower, jacuzzi and a large romantic oval bathtub that will give you both exclusivity and adventure in a nature reserve. Kalima Resort & Spa’s bathtub is stocked with Kalimas's own marine essence toiletries. Indulge your senses with the romantic fragrance while enjoying the view of the magnificent vista. 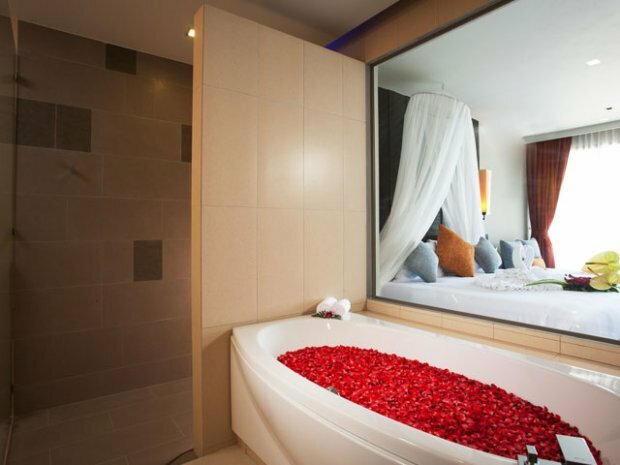 Built in an outdoor tropical garden, CK Villas Bali’s semi-jacuzzi double size bathtub filled with red and pink petals will keep the flame of passion burning. Don’t get too excited when dipping into the water so you won’t break the fragile petal heart too soon! Located in midtown Manhattan, The Algonquin Hotel Times Square, Autograph Collection presents a charming Barrymore bathroom with a rose-filled bathtub to give a romantic ambience while maintaining class and style. After going through this list of soak-worthy bathtubs around the world, I’m sure you’ll never quite view hotel tubs the same way again. I actually have much higher expectations now. What are some of the best bathtubs you’ve seen from your travels?